By Travis - Peru - 04 Jul/03 - Viewed 1661 times. Abi and I arrived in Cusco on Thursday night after a 13 hour bus ride from La Paz. We met her parents (John & Merre) and younger brother (Seth) at the airport the next morning, then all five of us checked in to Los Aticos where we had a small apartment that slept all five of us comfortably. Friday afternoon we took a tour of the city and some of the nearby Inca sites, most notably Sacsaywuam�n, the palace of the Inca. The next morning at 6:00 AM, we joined our group at the offices of SAS Travel on the Plaza de Armas for our trip to Macchu Picchu (two Austrailians, two Brits, two Norwegians and the five of us). We were on the train for about three hours before unloading at KM 102, where we crossed the Urabamba River on a footbridge and started hiking. After about three hours of uphill hiking, we reached Hui�ay Hauyna, an Inca site mainly consisting of row after row of agricultural terraces. The trail leveled out somewhat, and in a couple more hours we arrived at the Sun Gate, where ironically enought it started to rain. This was our first view of Macchu Picchu, dimmed as it was by clouds and rain. We spent about thirty minutes in this area before taking the bus to Aguas Calientes, where we stayed the night and enjoyed a dip in the thermal baths for which the town is named. 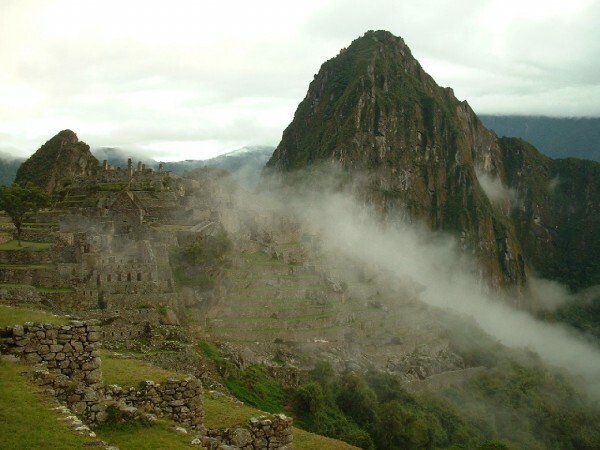 An early wake-up call got us on the first busload of visitors to Macchu Picchu the next morning. Our tour guide, Freddy, led us around the site for about two hours explaining this and that about the ruins and the culture. We had a few hours of free time, so we hiked to the top of Hauyna Picchu, the mountain on the opposite side of the ruins from the Sun Gate, and had a nice look at the entire site. Around 3:00 PM, we went back to Aguas Calientes for a late lunch, then boarded the train back to Cusco. The following day we did some shopping, laundry, and rested up for our next adventure--rafting the Apurimac River. The two guides (Wilbur from Cusco, and Steve from England) and the driver picked us up at Los Aticos at 9:30, and it was a four hour drive to the put in. We inflated the raft and the cata-raft, packed our few belongings into dry bags, and were on the river at 4:00 PM. We practiced the various strokes, shot a couple of Class II and III rapids, and made it to the first camp after an hour. We set up camp (Abi and I had our own tent, John & Merre in another, Seth by himself), had a nice meal of steak and mashed potatoes, and chatted around the campfire--pretty much the routine for each evening. The rapids got progressively bigger, wetter and wilder each of the four days of the trip, and we ran a couple of Class Vs (we had four portages around rapids that were too dangerous for commercial rafting, or simply impassible). I was the first victim of the river on the second day, when Wilbur yelled "Get down!" as we went into a hole. I got into the bottom of the raft as instructed, and held on to the rope encircling the raft with my left hand. The wave punched the bottom of the raft, and my body rotated in an arc with my left hand (holding the rope) as the pivot point, and I landed outside the boat. Wilbur quickly pulled me back in, and I was laughing my head off. The next day, Seth and I were dumped out of the raft as we were both on the left side, which was submerged by a huge wave in another Class III rapid. Once we surfaced we were both laughing and high-fiving before we remembered to look for Wilbur who threw us a safety rope and hauled us back in. The only other times we swam were voluntary. On the third morning of the trip, we broke camp and walked to the top of a Class II rapid where we all swam to the middle of the river and assumed the proper position--looking down stream, feet in front, and arms out to the side. The rapid was about 200 meters long, and some of us had a tough time of it. We all thought it was a good experience though, as it motivated us to do everything possible to stay in the raft in the more dangerous rapids. Then on the last day we had another chance to swim an easy rapid, but only Seth and I took them up on the offer. We arrived back in Cusco late that afternoon, and flew to Lima and then to Iquitos the next day, where we start our trip down the Amazon.